Having provided live visuals for the likes of Kraftwerk, The Chemical Brothers, Richie Hawtin and Aphex Twin, and regularly performing at Glastonbury's Dance Village, along with a host of other European festivals, Newcastle's NOVAK collective have proved themselves masters of creating live audio/visual experiences. In fact, when we spoke to dubstep supergroup Magnetic Man last year, they had a host of positive things to say about the group, who were responsible for creating the trio's impressive live visuals. This week the visual artists and DJs hit the road with their groundbreaking crossover DJ and AV project, the NOVAK 3D Disco, a club night that is, as they describe it, an "immersive three dimensional audiovisual extravaganza." 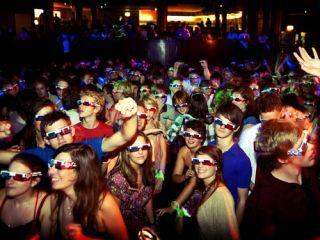 The club nights see thousands of revellers donning iconic, retro blue and red 3D specs while the NOVAK crew spin an eclectic selection of tunes, all-the-while accompanied by ever changing 3D visuals. While we here at MusicRadar like to think we know our way around a DJ booth, we wouldn't even know where to begin with VJing. So we spoke to Nikolas Barrera of NOVAK, ahead of the tour kicking off in Sheffield tonight, to ask a few questions and find out more about how it all works. Check out the full list of UK tour dates on the next page. How long have you been doing the 3D Disco now? "We've been working on NOVAK 3D Disco since early 2006. We took our early experiments out into clubs and the reaction was wild!" Could you explain the concept behind the 3D Disco, what can people expect in terms of music and visuals? "As a collective of DJs and VJs we wanted to develop a show and experience that genuinely put the visual element at the forefront. Since then we have further developed the set, performed with Calvin Harris, Kraftwerk, DJ Yoda and the Chemical Brothers and expanded our 3D skills! "NOVAK 3D Disco is a melee of club based music - hip hop elements, house, bmore, dubstep, disco and kitsch classics with bespoke tongue in cheek video and motion graphics all in 3D. "All the audience members receive a pair of 3D glasses to get the full experience. This is all mixed live into a blisteringly fast club set!" What equipment are you using to control the visuals? "We use the Modul8 video programme, Ableton Live for audio, Max for Live and our own bespoke plug-in for 3D rendering." From the perspective of someone who DJs but has never done any AV stuff, what are the main differences between live VJing and DJing? Do you think it takes similar skills? "AV shows are unusual in that they generally don't allow the same level of flexibility as normal DJ has. There are of course DVJ's and Serato with video out there but for our show and to ensure the 3D actually works (DVD quality won't cut it) it has to stay high resolution meaning we had to experiment and settle on a bespoke set-up really. "Having said that we have worked hard on having as many options as possible for the live show and I'd say it is practically there now. "We can easily switch between house, club classics, wobbly, re-edits, UK funky/bass and minimal - so we are close to what a normal DJ can do. "The system allows anyone of our DJs to control/manipulate the visuals - meaning we can mix it up/switch mid set!" Of the musician you've worked with in the past, what projects stand out as highlights? "Probably have to say Kraftwerk in Romania! Obviously because they are legends/heroes (and we got to meet Ralf!) but also because it was at the Sala Palatului venue - a Communist era grandiose concert hall. Surreal. "Although playing to 9000 people alongside Calvin Harris in the open air at Trafalgar Square in London was pretty special. Now that you've done 3D, what would you like to incorporate next? Any ideas of new concepts you'd like to try in the future? "Next for us is building on the 3D Disco 360 version which is an immersive 'in the round' version - which looks unbelievable!"